Spectators at the Haikou Stadium arena in the Hainan Island saw another scrappy clash and another major upset of the 2012 World Open Snooker tournament when the most favourite potter of the tournament, the reigning World Snooker Champion John Higgins faced a brutal defeat at the hands of England’s Robert Milkins. The Scotsman had been playing brilliantly throughout the tournament and was on the highway to claim the Chinese glory after winning the World Open title but the Englishman stopped his run with a tremendous snooker display. The Scot was not able to tackle Milkins’ fury as he came at the baize to clinch the quarter-final victory by the score line of 5-3. The Gloucester potter pressurised the Wizard of Wishaw from the very beginning playing impressive snooker shots. 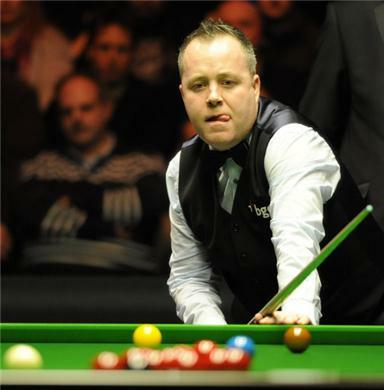 He knew that to win over Higgins, he must push him down from the start. He pocketed some excellent knocks of 117, 97, 75 and 76 to oust his veteran opponent by 5-3. The Englishman broke the silence with a couple of cracking clearances of 117 and 97 to clinch back-to-back frame wins and lead the game 2-0. The four-time World Champion bounced back immediately in the next frames and pulled level at 2-2 after winning third and fourth frame with two stunning knocks of 67 and 136. Milkins compiled two more set wins firing 75 and 76 breaks to move within 4-2. Higgins hit the fifth frame with a nice 91 clearance but it was not enough as the 35-year-old Milkins stole the show in the eighth frame to place himself in the semi-final line-up against compatriot Stephen Lee.